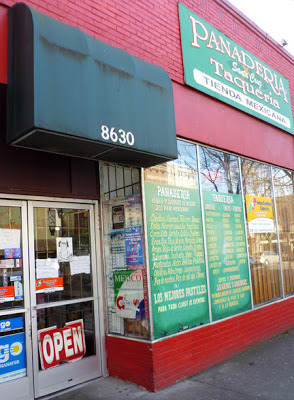 I went on a burrito pilgrimage the other day, to experience the grub from a taqueria in the back of a little market. Located at 8630 North Lombard Street in St Johns, this nondescript, shabby little place could easily be missed. 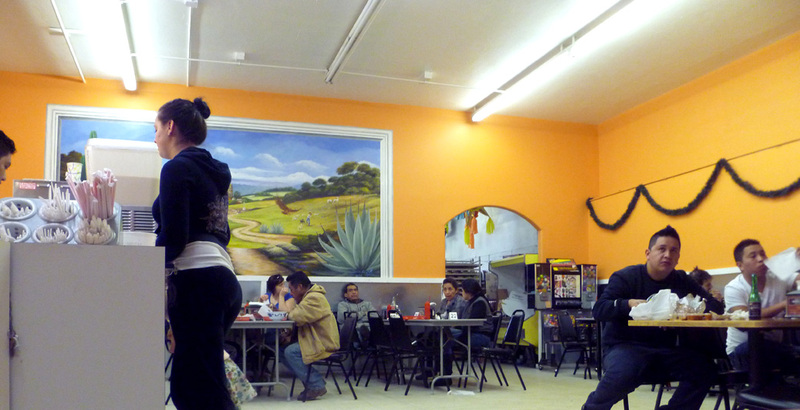 You'd never expect such a bustling place shoved in the back, though it felt more like a cafeteria than a restaurant. Very utilitarian- no extravagance needed. They were also cranking out some super delicious looking pastries, if you want desert. Not that you'll need it! Sides: Red and Green Salsa, Pastry for desert! I've always hated the word "authentic." What amount of truth can such a word hold in modern society? Culture is a mixed up mess; mocking its predecessors, constantly changing, building on its own forgotten history. Nothing is "real," yet everything is. 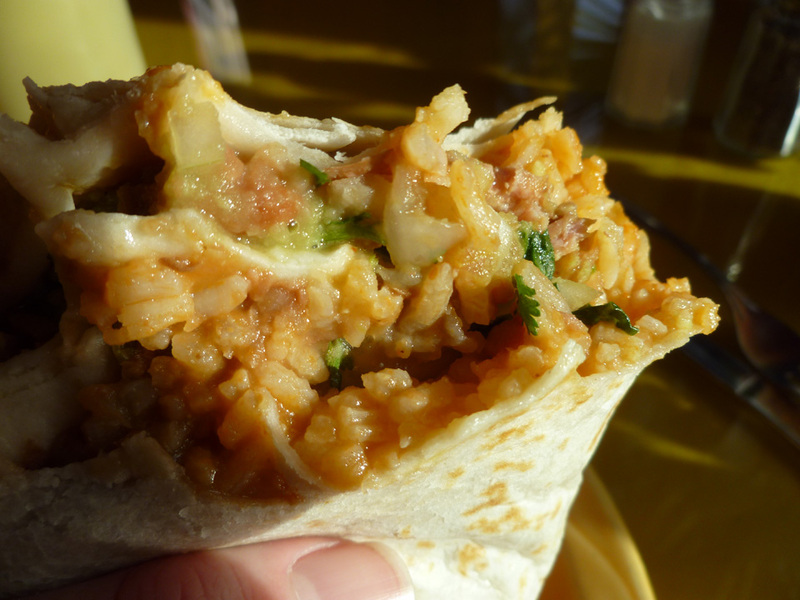 However, authentic is the word that comes to mind when describing this burrito experience. Although, there was no one slaughtering goats out back (at least I don't think so). Plus, I don't even consider burritos authentic Mexican cuisine, but somehow, this was really really real. Pure and simple. The tortilla was phenomenally crisp and chewy at the same time. How'd they do that? There was too much of it, but it was so yummy that I didn't care. The thinly sliced steak was subtle and savory, if a bit on the chewy side. The rice and beans added little to the overall essence. Cilantro and onion. Yeah! But... the whole time I was eating, I was wishing that I had gotten the tacos instead. I know... I know... I'm a burrito junkie- tacos are for pansies, right? But hear me out. This was like eating a giant taco; it was just too much of the same thing. If I were eating a variety of tacos, fresh squeezes of lime every now and then... it would have been heavenly! 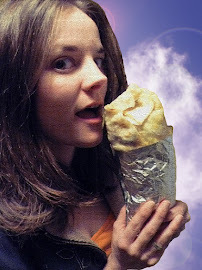 When I'm chowing down on a burrito, I want that juicy, saucy, cheesy, oozy, dynamic mesh of flavors and textures tickling my senses. This was just too simple, too primordial. 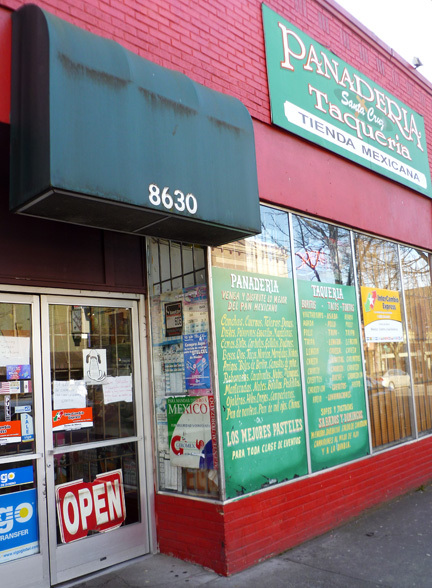 If you're taking it back, taking it waaaaaaaaaaay back, taking it to the street... take it to the tacos. if it were tacos and I was the taco aficionado... a million out of 5! Cha Cha Cha is a local Portland chain. 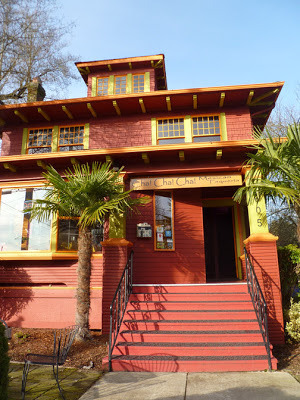 I visited the one located in Sellwood, at 1605 SE Bybee. It's in a colorful foursquare style home, which makes for a bright, funky, inviting atmosphere. Wherever you are, you probably aren't far from a Cha Cha Cha. It looked pretty! As for the taste, it was tantalizingly... devoid. 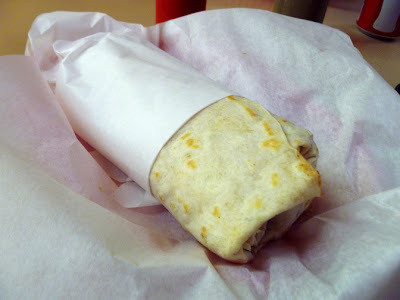 It brought about lucid memories... of all those boring gringo burritos I've had in the past. Experiences like this blend together in a swirling, whirling, empty hole in my brain. 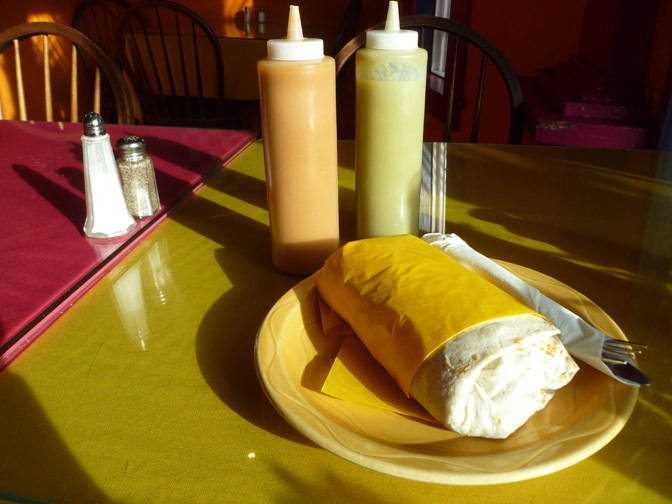 Once it's unwrapped from it's pretty yellow paper, I couldn't pick it out of a lineup of suspect burritos. Can't you just see them all lined up against a wall, drooping over sadly, as they try to stand upright? It seemed decently fresh, I'll give it that much. At least it wasn't made from dehydrated bean packets and partially hydrogenated soybean scum scraped from the bottom of an enormous vat in a rat infested factory in the outskirts of Chicago. The plethora of rice, mixed with the minuscule amount of pork, was like hunting for "a needle in a haystack" or going on a "wild goose chase." 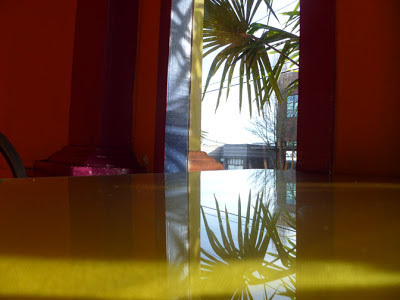 Inspiring nothing, but hackneyed adages. Expected, so expected. A burrito for the novice. A burrito for the children. A burrito for someone who fears Mexican food. 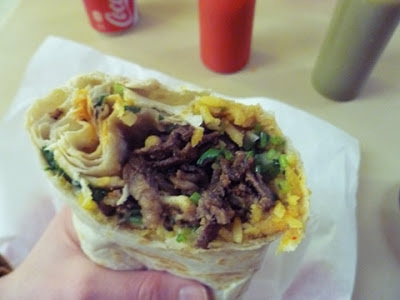 A burrito that doesn't fill up that hollow feeling, no matter how big it is. You are nothing to me! NOTHING! Ok, I understand that a lot of people like Cha Cha Cha... Take your kids their for quesadillas. 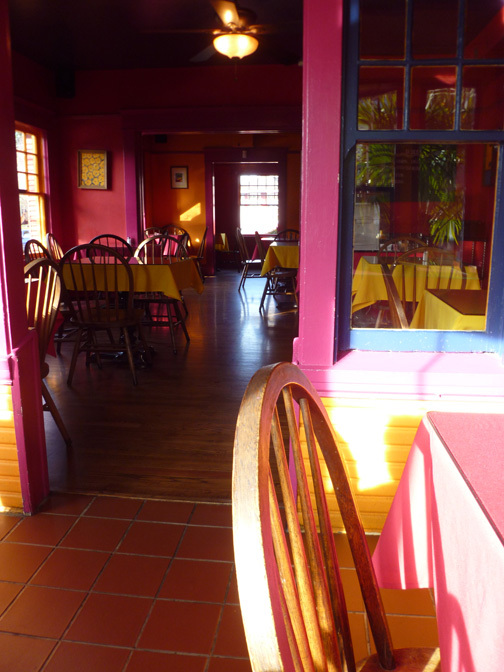 Take your grandparents there for a friendly atmosphere, and food that won't wreck any sensitive intestines. You stick to your banal burritos. I'll stick to my trashed-out-greasy-fatty-heart-attack-delights, thank you very much. Cha Cha Cha? Try Cha Cha BLAH!